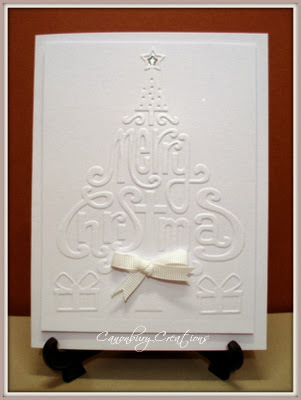 Canonburycreations: Less is More week 140-Christmas WOW! Less is More week 140-Christmas WOW! For our challenge this week, we have chosen to add another parameter to our colour challenge and that is that the submissions must be Christmas related cards. We would like to remind everyone that submissions must adhere to the Guidelines set out above and be evidently Clean and Simple! It's also a new month which means a new sponsor and this month we are excited that Stephanie from Clearly Besotted is our sponsor. Clearly Besotted are Celebrating their first birthday this month too! WOW is such a lovely theme but a nightmare to get a decent photograph! This was made with offcuts using an EF and a MB die. Thanks to everyone for the anniversary wishes, we had a great night at the theatre, The Commitments was brilliant, amazing singing, a definite hit! Very nice meal too in Covent Garden Looking forward to a nice warm break and lots of good food! Thanks for visiting and hopefully leaving a comment so I can visit you. beautiful set of white on white cards, val! you really rocked the LIM challenge! Both are so beautiful Valerie! I love that white on white! They are both beautiful and elegant. Have a super holiday. Two great cards Val - agree about trying to photograph WOW cards! Glad you had a great anniversary celebration. Have a great break and I'll see you Saturday week. These are lovely Val, I love the one with the little houses! Stunning Valerie you just cant beat white on white and these two are just stunning. Hope whatever you are doing you are enjoying it ! 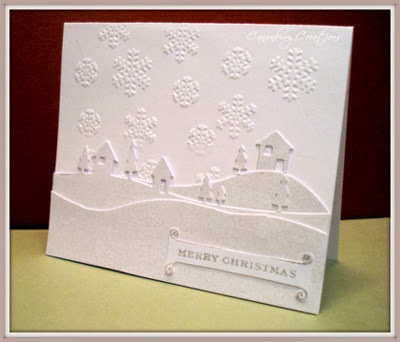 Two beautiful Christmas cards Val. Your pics. are perfect, but I agree that WOW is a nightmare to photograph!